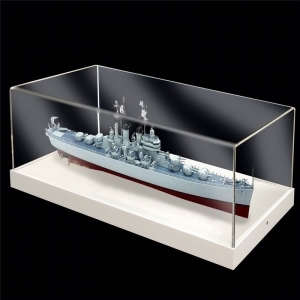 The model ship acrylic display cases are amde from 3mm thickness clear and white acrylic. Best material made it more luxury. 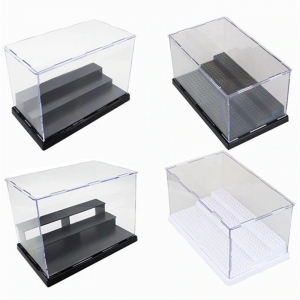 There are many different type of model display cases made from high transparency acrylic material for are, ship or toy. Logo printing is welcome. 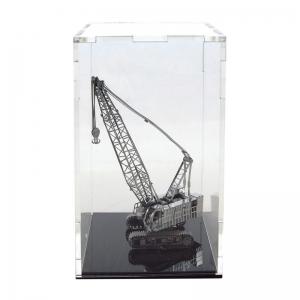 The acrylic model car display case with black base can be customzied to meet your size and demand. Logo printing is welcome. 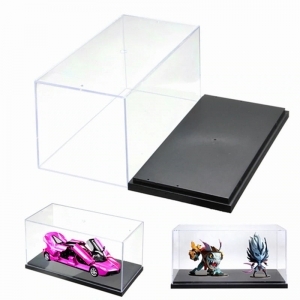 Just imagine, your treasured car model will be displayed in high transparency acrylic model case with black base, you will find this is not just the satisfaction of the car model. 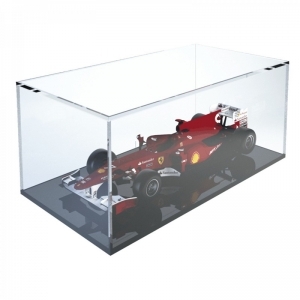 This is an acrylic display case designed made from 3mm thick clear acrylic. Inside model not included. 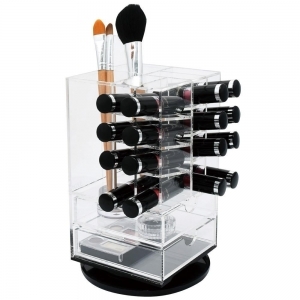 This black rotating acrylic lipstick tower are widely used in every country, it is a good choice to make your room tidy. 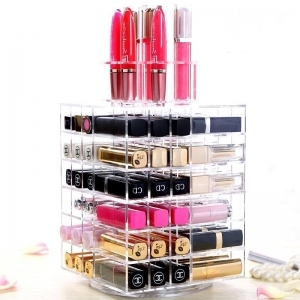 The rotating pink acrylic lipstick organizer can hold more than 24pcs lipstick. 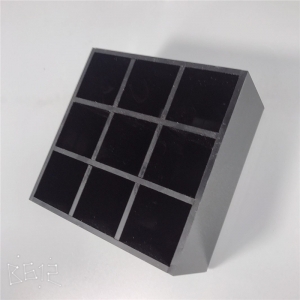 High transparency acrylic can help you choose anyone easily you like. 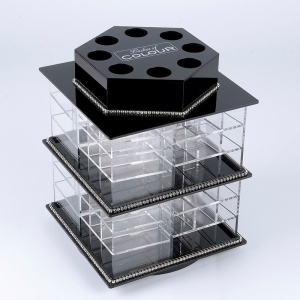 The Yageli clear acrylic lip gloss lipstick holder can display 30 lipstick or lip gloss. 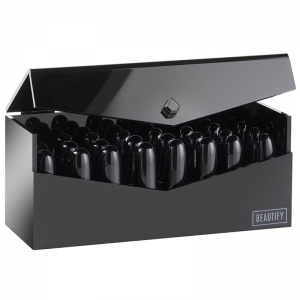 This black acrylic lip gloss display can hold 40 lipsticks. Size and color can be customized. Logo printing is welcome. There are 3 drawers and 32 lipstick dividers on the rotating acrylic makeup lipstick drawer. You will feel more confident if you have this luxury organizer to make up. Clear acrylic lip balm display lip gloss display Features: The rotating pink acrylic lipstick organizer can hold more than 20pcs lipstick. Rotating design can help you choose anyone easily you like. Color can also be customized like white and black. Logo printing is welcome:) Specifications: Company/Brand name: Anhui Yageli Display Co.,Ltd Material: A grade acrylic/Lucite/Plexiglass Function: Decorate/Display/Promoting OEM Design & Size : Accept Logo way: Silk-Screen, Printing,Scan, Sticker, Engraving Color: Clear,White, Black, red,other any color are avaliable Main Workmanship: Cutting, grinding,polishing, laser engraving Sample time: 3 to 5 workdays Mass order time: 25 to 40 workdays Mass order packing: Arap Film+bubble bags+foam+outer carton Payment Term: 30%-40% T/T in advance, the balance paid before shipment Product Advantage: 1. 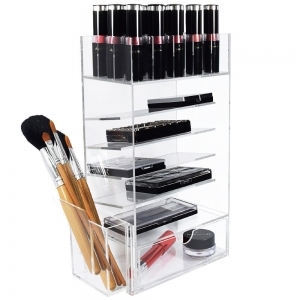 Durable & Elegant acrylic lipstick organizer. 2. Excellent transparency, the light transmittance over 98%; 3. Strong plasticity can be easily shaped and processed; 4. 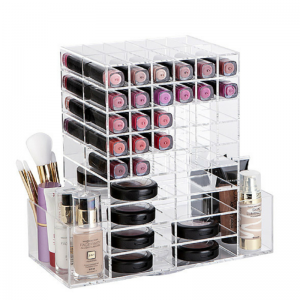 Easy to maintain and clean, this acrylic lipstick organizer. can be scrubbed with soap and soft cloth. More picture for reference: If you have any interest or question about acrylic lipstick organizer, or other acrylic products, Please kindly send me inquiry.